Ephraim Cleibron was born to James and Melinda Clayborn on 29 January 1852 in DeKalb County, Tennessee. While his father and siblings used various spellings of the surname, Ephraim’s is particularly unique and most unlike any other in the family. He had begun using this spelling by 1900. Ephraim married Sarah Jane “Janie” Neal (1844-1943), the step-daughter of his older sister Sarah Frances, on 25 July 1872 in DeKalb County. Ephraim died in about 1905 in Smith County, Tennessee. Sarah Jane Cleibron (“Sallie”) was born in about 1874 in DeKalb County, Tennessee, and died before 1900. In the 1900 census her mother lists five living children but does not include her. William Overton Cleibron was born in April 1875 in DeKalb County, Tennessee, and died in about 1905 in Smith County, Tennessee. In the 1910 census his mother lists four living children but does not include him. Melinda Frances Cleibron was born on 13 June 1877 in DeKalb County, Tennessee. She married first to Zack Weatherly in about 1894 and together they had two children, listed below. She married second to Frank E. McLaughlin (1866-1952) on 4 February 1900 in Smith County, Tennessee, as his second wife and they lived in Bond County, Illinois. Melinda died on 30 April 1927 in Wilson County, Tennessee. She and Frank are both buried in Montrose Cemetery in Bond County. Earl Weatherly was born in May 1895 in Smith County, Tennessee, and died after 1910. Zack Adam Weatherly was born on 16 May 1897 in Smith County, Tennessee, and died in January 1965 in Pinellas County, Florida. James Arthur Cleiborn (“Arthur”) was born on 13 February 1881 in DeKalb County, Tennessee, and resided in Brush Creek, Tennesee. Verner M. Claybourn had some correspondence with him. Arthur married on 29 December 1900 to Bertha Boone “Bertie” Davis (1879-1951). Bertie died on 28 August 1951 and Arthur died on 15 October 1960 in Wilson County, Tennessee. Both are buried in the Brush Creek Cemetery. Mary Dexie Cleibron was born on 15 March 1909 in Smith County, Tennessee. She married William Elbert Ford (1907-1983) on 29 June 1928 in Smith County. Mary died on 11 February 1993 in Wilson County, Tennessee. Willard Cordell Cleibron was born on 30 August 1915 in Smith County, Tennessee. He married Kathleen Nixon (1917-2005) in about 1938. Willard died on 3 November 1964 in Wilson County, Tennessee. Thomas Jefferson Cleibron was born on 26 November 1884 in Tennessee. He married Daisy Martin (1882-1938) on 21 May 1910 in Putnam County, Tennessee. 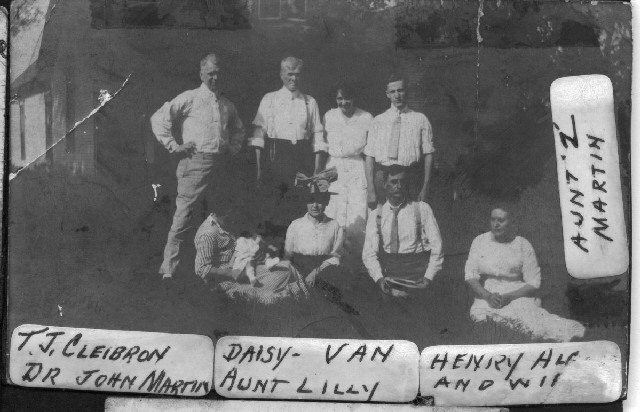 [Daisy Martin was born in March 1882 to John Ballard Springs Martin (1848 – 1926) and Lillie Dale Crutcher (1857 – 1927).] Thomas died on 22 July 1956 in DeKalb County, Georgia. Lilly Jo Cleibron was born in 1916 in Nashville, Tennessee. In the 1940 census she was living with her widowed father in DeKalb County, Georgia. Hallie Beatrice Cleibron (“Beatrice”) was born on 25 February 1891 in Tennessee. She married first in 1909 to Charles Marion McLaughlin (1873-1947), brother of her older sister Melinda’s second husband. Their family lived in Illinois and some sources indicate that they had six children, including the three listed below. Beatrice married second to Alvin William Weindel (1981-1975) as his second wife in about 1951. Hallie died on 4 March 1992 in Madison County, Illinois. Cledys L. McLaughlin was born on 5 December 1911 in Bond County, Illinis. She married Albina L. Derocco (1914-1975). Cledys died on 31 January 1998 in San Diego, California. Ferne Hallie McLaughlin was born on 2 September 1913 in Bond County, Illinois. She married Marion Clyde Love (1909-1990) in about 1939. Ferne died on 9 April 1976 in Madison County, Illinois. Madelyn Elaine McLaughlin was born on 7 February 1919 in Bond County, Illinois. She married Clarence “Jack” Weindel (1924-1992), a son of her mother’s second husband, in about 1948. Madelyn died on 27 October 1999 in Nueces County, Texas.